Back in March I wrote about a Chicago organization called New Moms who had a fire that destroyed their shelter. I got an email, blogged it, and Cinnamon posted it to Gapers Block. Somehow they identified me as someone they needed to get to know better, so I went out today for a site visit. Talk about power of the blog. First, they work with homeless teenage moms. It's hard to find a group that is more invisible in society. How invisible? According to the City of Chicago, they reported zero percent homeless youth last year. 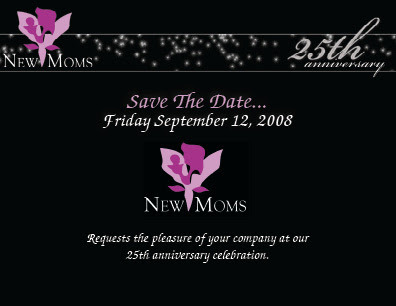 Well, New Moms has room for about 50 homeless youth who are mothers and up to two of their children. I'm gonna trust New Moms on this one. Illinois as a state has only about 110 beds for teen moms...doing the quick math, New Moms has half of those beds. They turn away 400-500 moms each year. They don't just shelter these young moms for up to two years, they also have education programming to help them earn their GEDs, get into vocational training, and the cream of the crop get paid internships. I peeked into one of the education sessions today and the women were all 20 or under, some with two kids. All have career aspirations such as nursing and catering. I also got to peek in on the daycare that the organization has for when the moms are in their classes. I saw the cutest 4-week old girl...she looked just like my daughter when she was little! She even had all that hair. OMG, I think that was when I fell in love with this group. I found everyone in the organization to be very welcoming. No one even flinched when I talked about how I found out about them. Since Firebelly had awarded the Chicago Abortion Fund with a grant, I was on their mailing list and they sent out an email about the fire. I talked with one staffer and she agreed that many of the women CAF works with are just like the women they work with...they just made a different decision on their pregnancy. But both sets of women need assistance in some way. I also got the distinct feeling that some of the women who end up at New Moms are women who ended up at crisis pregnancy centers, were promised help when the baby comes, and gets nothing more than a box of diapers and a bag of baby clothes. Have I tugged your heart strings enough? Well if you're in Chicago, you can attend their 25th anniversary dinner on September 12th. I'll be coming home from St. Louis that day. If you can't make it, click the invite there's a donation link too. I am glad to hear that such an organization is in existence. One of the things that get me most about the pro life movement is that advocate for birth and never speak about what happens after. Raising a child is a huge responsibility and it is an expensive undertaking. All new mothers need support especially the young ones.